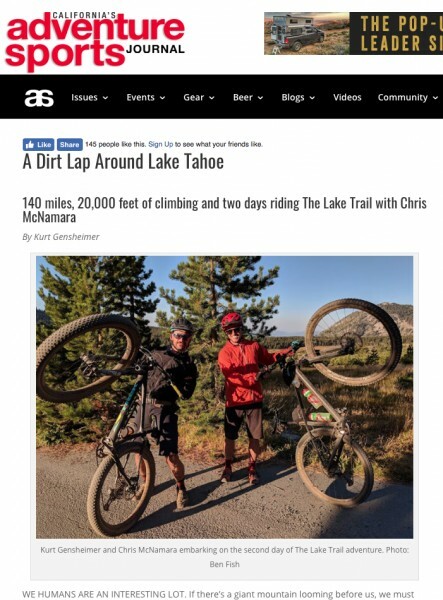 Anyway, while putting up Tahoe new routes if still an ongoing an fun activity, I realized in 2016 that one of the BIG "first ascents" in Tahoe would require a bike... creating the first legal singletrack around The Lake. Today 115 of 130 miles is in and we are chipping away at the permitting for the last 15. You can read a story about a ride of the existing stuff here we did last week. 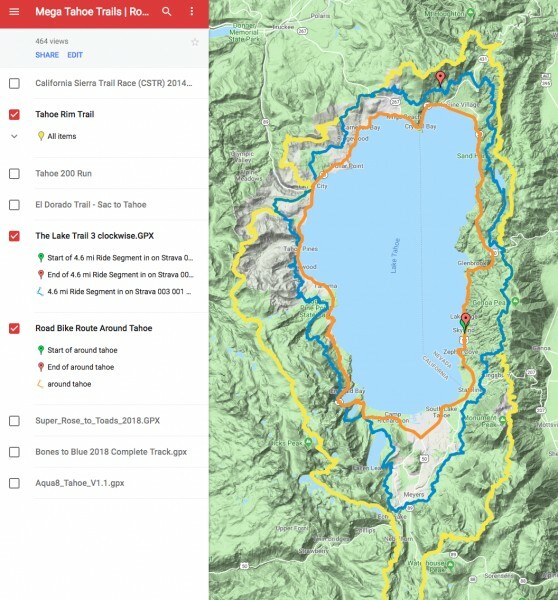 And see the mega trails around the lake here and see how The Lake Trail concept lines up with The Tahoe Rim Trail and other trails. On a side note, a great resource for this has been climbing and MTB legend Max Jones who owns Tunnel Creek Cafe, Flume Trail bikes and led the creation of the Flume Trail. So i'm just part of a strong tahoe lineage of climber/bikers. Outside Magazine called Chris one of “the world’s finest aid climbers.” He is the winner of the 1999 Bates Award from the American Alpine Club and founder of the American Safe Climbing Association, a nonprofit group that has replaced over 5000 dangerous anchor bolts. He is a graduate of UC Berkeley and serves on the board of the ASCA and the Rowell Legacy Committee. He has a rarely updated adventure journal, maintains BASEjumpingmovies.com, and also runs a Lake Tahoe home rental business. A mountain bike bump . . .
Inspiring to say the least. 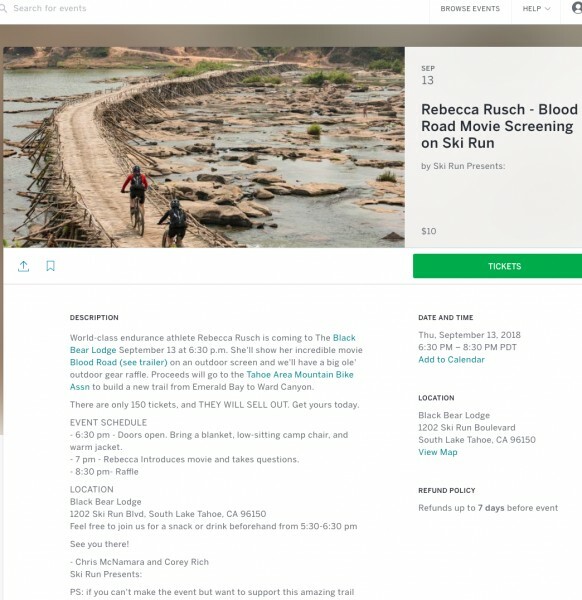 Nice work, Chris, Kurt, and everybody helping to make the route a reality. A worthy addition to the legendary recreation opportunities in the area. 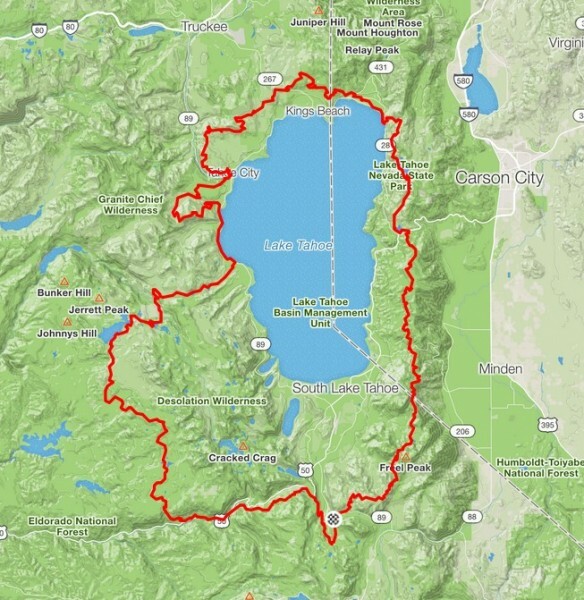 An old friend, Chris, local to Lake Tahoe, has been working on a new bike-able, all-dirt/ST circumnavigation of the Lake. The concept mimics some through-trails in Europe; resupply points not far off the trail and frequent enough for hikers. A couple of brief conversations gleaned some info, most notably, that the route mapping was complete but the trail work for some sections (all in conjunction with USFS) had not been done. Close enough for me; I’m in the area temporarily and so, made due with a .gpx file and sparse description. 130 miles in 3-5 days is what the route reputes to require. The route (a version of it), according to Chris, had been biked seven times, but not in a push with bikepacking gear. From Spooner Trailhead north, the Tahoe Rim Trail (which the Lake Trail uses in a couple of spots) heads right into one of the most famous and photographed trails in the area – The Flume Trail. Once on the Flume, it’s fast riding until the Mount Rose area. The route finding and terrain then turned “interesting,” traveling on decreasingly used trails, until, finally, the track just went off into the woods. No signs of travel, no trail. Eventually, weaknesses and signs of previous passage emerged. Heading into a thickly vegetated, sandy drainage, one eventually reaches a waterfall. The far side of this drainage (from which the photo was taken) held a weakness which looked like scrambling over large rocks. The “six feet of fourth class” that I was warned about. I recon’ed it without my bike and saw this was the way. Getting my bike up it proved NTB, with only one unexpected drop in elevation with no consequence aside from getting dirty. The rawness of this area kept coming – new and barely-used sections of trail and sheer XC travel through beautiful and rugged country. Eventually I hit more normal sections of trail, and finally threw down a bivouac after 40 miles, not far from Tahoe City (position 10:00 on the “Lake clock”). This day I hoped to meet the Weezl at Meeks Bay to swap out a phone battery pack, as the navigation sucked up my phone juice pretty quickly. The trail utilized some TRT, but also many other trails. The climbs and drops were more distinct here on the west side, which I felt by the time I arrived at Meeks. Said goodbyes and headed up to see what the Wilderness bypass in this area looked like and to find a bivy site. The route turned southeast off the trail in a place that looked committing to hike, let alone drag a bike, and this was a very long bypass. Yea, no thanks! I retreated to lower Meeks Creek and flopped near some small pools with fish darting about them. I worked my way back toward the Lake for the road bypass and reconnected with Lake Trail down at Bayview Trail, which ascends aside Cascade Lake to Cascade Falls. This trail is super rugged, and thankfully, riding it was not a question since I was going uphill. The trail (a very smooth part). After that I decided I would do what I could to stay on at least partially developed trail. I had slid off a talus boulder and was feeling the familiar discomfort of a rib bruise, as well as a biff to my left thigh that made itself known with every step and pedal stroke for the rest of the ride. Glad I was wearing my helmet, because it also contacted granite during the bumble. 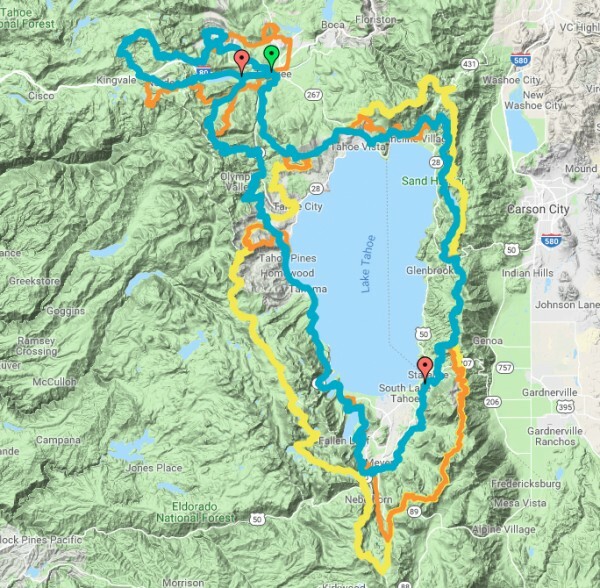 So I made the decision to stick nearer the Lake and cruise through South Lake Tahoe to where the trail looped back up toward the lakeshore. Part of my rationale for this was that I had a hard date to be finished, and didn’t want to endanger that. I probably missed a half day’s riding/hiking; I’ll know more about that area once I de-brief with Chris. The remaining trail worked its way back up to the TRT, in an area I’m familiar with. It started looking feasible to finish this day, so I moved forward with that in mind. Once at the Lake Overlook, I knew it was five miles of ripping DH to Spooner TH, the official end of my loop. A rider chugging up made for some nice conversation. So, with the usual late-day second wind and sun starting to drop, I gave the DH my standard risk-mitigation pace (less than all out). My bike handled so well, it was one of those magic moments. A point of vindication. After previous tribulations, what a way to finish. Words truly fail. At Spooner I turned west on the new Clear Creek Trail extension for the 15-mile ST mostly-drop to Jacks Valley. Stopped at the creek to fill a bottle without treating the water. The fading light made things slightly slower down low, but a bright moon picked up where twilight waned. Chugged the remaining 2.5 miles through the desert and, boom, it was over. What would I suggest to anyone thinking he wants to do this route (or a version of it)? Do it for the scenery, position, environment and trails. Do it because you love the Lake Tahoe area. Biking was somewhat incidental for me. I did loads of HAB and climb-a-bike. Sometimes your bike is just way to keep from hefting your gear. Sometimes it’s a liability. All the colors of off-road bike adventure are displayed vividly on the Lake Trail. Thank you, Chris, for your work on this project! I did a number of sections of the TRT many years ago and was always intrigued by the possibilities squelched by the Wilderness areas. Very cool to see this link up around the lake. Equally as impressive is that you've only been MTBing for 3 years?! Boffo performance, Chris, and thanks for that kind of service to the community. Mike, very nice story and pics. Mtn bikes and climbing are totally sympatico. Very nice. Thanks for all your effort Chris! And Mike O. You beast!! Great trip reports Chris and Mike. It is really cool to see all that you and TAMBA are doing up there. Huge thanks Chris for putting in the work for a western connector trail. We looped the lake a couple of years ago by way of pony express- wrights lake rd- rubicon. A singletrack option replacing the Rubicon will truly make the route world class! Good work all,looks like quite a loop. Hope I get there someday.